"M1 Tank" redirects here. For the early 20th Century light tank, see M1 Combat Car. The M1 Abrams is a third-generation American main battle tank named after General Creighton Abrams and designed by Chrysler Defense (now General Dynamics Land Systems). Designed as a highly mobile main-battle tank for modern armored ground warfare, the M1 is well armed and heavily armored. The Abrams introduced several notable and innovative features such as a powerful 1500 hp AGT1500 multifuel turbine engine, sophisticated Chobham composite armor, a computer fire control system and separate ammunition storage in a blow-out compartment along with NBC protection for crew safety. While the initial models of the M1 were armed with a licensed-produced 105 mm Royal Ordnance L7 gun, later variants feature a licensed Rheinmetall 120 mm L/44 for increased firepower. Weighing nearly 68 short tons (almost 62 metric tons), it is one of the heaviest main battle tanks in service. The M1 Abrams was developed as a result of the cancellation of the MBT-70 project which was afflicted with numerous technical issues and cost overruns. In 1971 Congress cancelled the project and ordered for a less costly alternative replacement for the ageing M60. Both Chrysler and General Motors supplied prototypes and the Chrysler model was selected for further development. Eventually the M1 Abrams entered U.S. service in 1980, ultimately replacing the M60 tank which had seen two decades of service at the time. The M1 currently serves as the main battle tank of the United States Army and Marine Corps, and is also used by the armies of Egypt, Kuwait, Saudi Arabia, Australia, and Iraq. 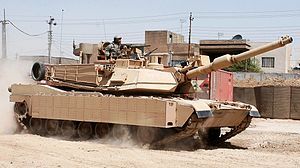 The Abrams was first tested in combat in the Persian Gulf War and has seen service in both the War in Afghanistan and Iraq War under U.S. service, while Iraqi Abrams tanks have seen combat in the war against ISIL and have seen use by Saudi Arabia during the Yemeni Civil War. The Abrams was due to be replaced by the Future Combat Systems XM1202 but due to the cancellation of the program the U.S. military has opted to continue maintaining and operating the M1 Abrams for the foreseeable future by upgrading the tank with improved optics, armor and firepower. Three main versions of the M1 Abrams have been deployed, the M1, M1A1, and M1A2, incorporating improved armament, protection, and electronics with each new model. These improvements and other upgrades to in-service tanks have allowed this long-serving vehicle to remain in front-line service. In addition, development of the improved M1A3 version was first publicly disclosed in 2009. Extensive improvements have been implemented to the latest M1A2C and D (formerly SEPv3 and SEPv4, respectively) versions such as improved composite armor, better optics, digital systems and ammunition. Congress canceled the MBT-70 in November and XM803 December 1971, and redistributed the funds to the XM1 Abrams named after General Creighton Abrams. Prototypes were delivered in 1976 by Chrysler Defense and General Motors armed with the license-built version of the 105 mm Royal Ordnance L7 gun along with a Leopard 2 "2K" prototype for comparison. The turbine-powered Chrysler Defense design was selected for development as the M1; Chrysler had significant experience designing turbine-powered land vehicles going back to the 1950s. Low initial rate production (LIRP) of the vehicle was approved on 7 May 1979. In February 1982, General Dynamics Land Systems Division (GDLS) purchased Chrysler Defense, after Chrysler built over 1,000 M1s. A total of 3,273 M1 Abrams tanks were produced during 1979–1985 and first entered U.S. Army service in 1980. Production at the government-owned, GDLS-operated Lima Army Tank Plant in Lima, Ohio, was joined by vehicles built at the Detroit Arsenal Tank Plant in Warren, Michigan from 1982 to 1996. The U.S. Army Laboratory Command (LABCOM), under the supervision of the United States Army Research Laboratory (ARL), was also heavily involved with designing the tank with M1A1 armor resistant shells, M829A2 armor-penetrating rounds, and improved weapon range. The M1 was armed with the license-built version of the 105 mm Royal Ordnance L7 gun. The tank featured the first of its kind Chobham armor. The M1 Abrams was the first to use this advanced armor. It consisted of an arrangement of metal plates, ceramic blocks and open space. 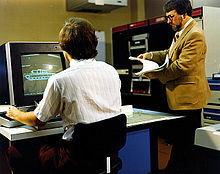 An improved model called the M1IP was produced briefly in 1984 and contained small upgrades. The M1IP models were used in the Canadian Army Trophy NATO tank gunnery competition in 1985 and 1987. About 5,000 M1A1 Abrams tanks were produced from 1986–92 and featured the M256 120 mm (4.7 in) smoothbore cannon developed by Rheinmetall AG of Germany for the Leopard 2, improved armor, consisting of depleted uranium and other classified materials, and a CBRN protection system. Production of M1 and M1A1 tanks totaled some 9,000 tanks at a cost of approximately $4.3 million per unit. By 1999, costs for the tank were upwards of US$5 million a vehicle. In 1990, Project on Government Oversight in a report criticized the M1's high costs and low fuel efficiency in comparison with other tanks of similar power and effectiveness such as the Leopard 2. The report was based on data from U.S. Army sources and the Congressional record. 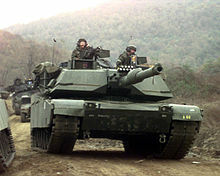 As the Abrams entered service in the 1980s, they operated alongside M60A3 within the United States military, and with other NATO tanks in numerous Cold War exercises. These exercises usually took place in Western Europe, especially West Germany, but also in some other countries, including South Korea. The exercises were aimed at countering Soviet forces. However, by January 1991, the Berlin Wall had fallen and the Abrams was instead deployed in the Middle East. The Abrams remained untested in combat until the Persian Gulf War in 1991, during Operation Desert Storm. A total of 1,848 M1A1s were deployed to Saudi Arabia to participate in the liberation of Kuwait. The M1A1 was superior to Iraq's Soviet-era T-55 and T-62 tanks, as well as T-72 versions imported from the Soviet Union and Poland. Polish officials state no license-produced T-72 (nicknamed Lion of Babylon) tanks were finished prior to the Iraqi Taji tank plant being destroyed in 1991. The T-72s, like most Soviet export designs, lacked night vision systems and then-modern rangefinders, though they did have some night-fighting tanks with older active infrared systems or floodlights. A total of 23 M1A1s were damaged or destroyed during the war. Of the nine Abrams tanks destroyed, seven were destroyed by friendly fire, and two were purposely destroyed to prevent capture after being damaged. Some others took minor combat damage, with little effect on their operational readiness. Very few M1 tanks were hit by enemy fire and none were destroyed as a direct result of enemy fire, none of which resulted in any fatalities. The M1A1 was capable of making kills at ranges in excess of 2,500 metres (8,200 ft). This range was crucial in combat against previous generation tanks of Soviet design in Desert Storm, as the effective range of the main gun in the Soviet/Iraqi tanks was less than 2,000 metres (6,600 ft). This meant Abrams tanks could hit Iraqi tanks before the enemy got in range—a decisive advantage in this kind of combat. In friendly fire incidents, the front armor and fore side turret armor survived direct armor-piercing fin-stabilized discarding-sabot (APFSDS) hits from other M1A1s. This was not the case for the side armor of the hull and the rear armor of the turret, as both areas were penetrated on at least two occasions by unintentional strikes by depleted uranium ammunition during the Battle of Norfolk. During Operations Operation Desert Shield and Desert Storm some M1IP and M1A1s were modified locally in theater (in the war zone) by modification work orders (MWO) with additional rolled homogenous armor plating welded on the turret front. The M1 can be equipped with mine plow and mine roller attachments. The M1A2 was a further improvement of the M1A1 with a commander's independent thermal viewer, weapon station, position navigation equipment, and a full set of controls and displays linked by a digital data bus. These upgrades also provided the M1A2 with an improved fire control system. The M1A2 System Enhancement Package (SEP) added digital maps, Force XXI Battle Command Brigade and Below (FBCB2) Linux communications system capabilities for commanders, and an improved cooling system to compensate for heat generated by the additional computer systems. The M1A2 SEP also serves as the basis for the M104 Wolverine heavy assault bridge. The M1A2 SEPv2 (version 2) added Common Remotely Operated Weapon Station (CROWS or CROWS II) support, color displays, better interfaces, a new operating system, better front and side armor, and an upgraded transmission for better durability. Further upgrades included depleted uranium armor for all variants, a system overhaul that returns all A1s to like-new condition (M1A1 AIM), a digital enhancement package for the A1 (M1A1D), and a commonality program to standardize parts between the U.S. Army and the Marine Corps (M1A1HC). The development for the improved M1A3 variant has been known since 2009. Abrams crossing the Euphrates River at Objective Peach on ribbon assault float bridge deployed by the 299th Engineer Company in 2003. Further combat was seen during 2003 when U.S. forces invaded Iraq and deposed Ba'athist Iraqi leader Saddam Hussein in the Iraq War's Operation Iraqi Freedom. As of March 2005, approximately 80 Abrams tanks were forced out of action by enemy attacks. 63 tanks were restored, while 17 were damaged beyond repair. 3 of them at the beginning 2003. One achievement of the M1A1s was the destruction of seven T-72s in a point-blank skirmish (less than 50 yards (46 m)) near Mahmoudiyah, about 18 miles (29 km) south of Baghdad, with no U.S. losses. In addition to the Abrams's heavy armament, some crews were also issued M136 AT4 shoulder-fired anti-tank weapons under the assumption that they might have to engage heavy armor in tight urban areas where the main gun could not be brought to bear. M1A1 conducts reconnaissance in Iraq, September 2004. Following lessons learned in Desert Storm, the Abrams and many other U.S. combat vehicles used in the conflict were fitted with Combat Identification Panels to reduce friendly fire incidents. These were fitted on the sides and rear of the turret, with flat panels equipped with a four-cornered 'box' image on either side of the turret front. Some Abrams tanks were also fitted with a secondary storage bin on the back of the existing bustle rack on the rear of the turret (referred to as a bustle rack extension) to enable the crew to carry more supplies and personal belongings. Several Abrams tanks that were irrecoverable due to loss of mobility or other circumstances were destroyed by friendly forces, usually by other Abrams tanks, to prevent their capture. Some Abrams tanks were disabled by Iraqi infantrymen in ambushes during the invasion. Some troops employed short-range anti-tank rockets and fired at the tracks, rear and top. Other tanks were put out of action by engine fires when flammable fuel stored externally in turret racks was hit by small arms fire and spilled into the engine compartment. A majority of Abrams tanks damaged in post-invasion Iraq were by improvised explosive devices (IEDs). By December 2006 more than 530 Abrams tanks had been shipped back to the U.S. for repair. M1A2 Abrams with prototype Tank Urban Survival Kit armor upgrade equipment and Common Remotely Operated Weapons Station (CROWS), with a .50 caliber machine gun at the commander's station. Due to the vulnerability of tanks in urban combat, the Tank Urban Survival Kit (TUSK) was issued to some M1 Abrams tanks. It added protection in the rear and side of the tank to improve fighting ability in urban environments. In May 2008, it was reported that a U.S. M1 tank had also been damaged in Iraq by insurgent fire of a Soviet-made RPG-29 "Vampir", which uses a tandem-charge high explosive anti-tank warhead to penetrate explosive reactive armor (ERA) as well as composite armor behind it. The U.S. considered the RPG-29 threat to U.S. armor high and refused to allow the newly formed Iraqi Army to buy it, fearing that it would fall into the insurgents' hands. Between 2010 and 2012 the U.S. supplied 140 refurbished M1A1 Abrams tanks to Iraq. In mid-2014, they saw action when the Islamic State of Iraq and the Levant launched the June 2014 Northern Iraq offensive. During three months, about one-third of the Iraqi Army's M1 tanks had been damaged or destroyed by ISIL and some were captured by opposing forces. By December 2014, the Iraqi Army only had about 40 operational Abrams left. That month, the U.S. Department of State approved the sale of another 175 Abrams to Iraq. Iranian-backed Iraqi Shiite Kata'ib Hezbollah (Hezbollah Brigades) reported to operate M1 Abrams, and released publicity showing the tanks being transported by trucks to take part in the battle of Mosul. It is not known whether the tanks were captured from ISIS, seized from Iraq's military, or handed over. One Iraqi-operated Abrams has been nicknamed "The Beast" after it became the lone working tank when taking back the town of Hit in April 2016, destroying enemy fighting positions and IED emplacements. In October 2017, Abrams were used by the Iraqi security forces and the Popular Mobilization Forces (also called Al-Hashd al-Shaabi) in assaults against the Kurdistan Regional Government Peshmerga in the town of Altun Kupri (also called Prde). It was claimed by Kurdish commanders that at least one Abrams was destroyed by the Peshmarga. Tanks may have limited utility in Afghanistan due to the mountainous terrain, although Canada and Denmark have deployed Leopard 1 and 2 MBTs that have been specially modified to operate in the relatively flat and arid conditions of southwestern Afghanistan. In late 2010, at the request of Regional Command Southwest, the U.S. Marine Corps deployed a small detachment of 14 M1A1 Abrams tanks from Delta Company, 1st Tank Battalion, 1st Marine Division (Forward), to southern Afghanistan in support of operations in Helmand and Kandahar provinces. After the start of the Saudi Arabian intervention in Yemen during the 2015 Yemeni Civil War, Saudi Arabian M1A2 MBTs were deployed near the Saudi Arabian/Yemeni border. [verification needed] In August 2016, the U.S. approved a deal to sell up to 153 more Abrams tanks to Saudi Arabia, including 20 "battle damage replacements", suggesting that some Saudi Arabian Abrams had been destroyed or severely damaged in combat in Yemen. The U.S. Army planned to end production at the Lima Army Tank Plant from 2013 to 2016 in an effort to save over $1 billion; it would be restarted in 2017 to upgrade existing tanks. General Dynamics Land Systems (GDLS), which operates the factory, opposed the move, arguing that suspension of operations would increase long-term costs and reduce flexibility. Specifically, GDLS estimated that closing the plant would cost $380 million and restarting production would cost $1.3 billion. By August 2013, Congress had allocated $181 million for buying parts and upgrading Abrams systems to mitigate industrial base risks and sustain development and production capability. Congress and General Dynamics were criticized for redirecting money to keep production lines open and accused of "forcing the Army to buy tanks it didn't need." General Dynamics asserted that a four-year shutdown would cost $1.1–1.6 billion to reopen the line, depending on the length of the shutdown, whether machinery would be kept operating, and whether the plant's components would be completely removed. They contended that the move was to upgrade Army National Guard units to expand a "pure fleet" and maintain production of identified "irreplaceable" subcomponents; a prolonged shutdown could cause their makers to lose their ability to produce them and foreign tank sales were not guaranteed to keep production lines open. There is still risk of production gaps even with production extended through 2015; with funds awarded before recapitalization is needed, budgetary pressures may push planned new upgrades for the Abrams from 2017 to 2019. In December 2014, Congress again allocated $120 million, against the wishes of the Army, for Abrams upgrades including improving gas mileage by integrating an auxiliary power unit to decrease idle time fuel consumption and upgrading the tank's sights and sensors. The tracked M8 Armored Gun System was conceived as a possible supplement for the Abrams in U.S. service for low-intensity conflict in the early 1990s. Prototypes were made but the program was canceled. The eight-wheeled M1128 Mobile Gun System was designed to supplement the Abrams in U.S. service for low-intensity conflicts. It has been introduced into service and serves with Stryker brigades. The U.S. Army's Future Combat Systems XM1202 Mounted Combat System was to replace the Abrams in U.S. service and was in development when funding for the program was cut from the DoD's budget. Engineering Change Proposal 1 is a two-part upgrade process. ECP1A adds space, weight, and power improvements and active protection against improvised explosive devices. Nine ECP1A prototypes have been produced as of October 2014. ECP1B, which will begin development in 2015, may include sensor upgrades and the convergence of several tank round capabilities into a multi-purpose round. The M1A2 SEP TUSK Abrams and a modernized M1 Abrams were included in the Ground Combat Vehicle (GCV) Analysis of Alternatives (AOA). Vehicles included in the AOA were determined to be inferior to the planned GCV. The U.S. Army Vice Chief of Staff Gen. Peter Chiarelli commended the M1 Abrams program and recommended a similar approach for the GCV program. The Ground Combat Vehicle family of vehicles was the planned successor to the M1 as well as many other U.S. Army vehicles. However, the Army anticipates that the remaining M1A1 fleet will remain in U.S. service until at least 2021, and the M1A2 to beyond 2050. The M1A3 Abrams was in the early design period with the U.S. Army in 2009. At that time, the service was seeking a lighter tank version with the same protection as current versions. It aimed to build prototypes by 2014 and begin fielding the first combat-ready M1A3s by 2017. In March 2017, it was reported that the new version, the M1A2 SEP v4, is to begin testing in 2021. Additionally an all new version for the U.S. Army has been in planning and development for several years. U.S. M1A1s during the Foal Eagle 1998 training exercises in South Korea, with their factory single green paint scheme. M1A1 in the Australian Army's Disruptive Pattern Camouflage, used for vehicles and materiel. Earlier U.S. military vehicles, used from World War I through the Vietnam War, used a scheme of "olive drab", often with large white stars. Prototypes, early production M1 (105 mm gun) and M1-IP models switched to a flat forest green paint scheme. The large white insignia stars have also transitioned to much smaller black markings. Some units painted their M1s with the older Mobility Equipment Research and Design Command (MERDC) 4-color paint scheme but the turn-in requirements for these tanks required repainting them to overall forest green. Therefore, even though a large number of the base model M1s were camouflaged in the field, few or none exist today. M1A1s came from the factory with the NATO three color camouflage Black/Med-Green/Dark-Brown Chemical Agent Resistant Coating (CARC) paint jobs. Today M1A1s are given the NATO three color paint job during rebuilds. M1s and M1A1s deployed to Operation Desert Storm were hastily painted desert tan. Some, but not all, of these tanks were re-painted to their "authorized" paint scheme. M1A2s built for Middle Eastern countries were painted in desert tan. Replacement parts (roadwheels, armor skirt panels, drive sprockets, etc.) are painted olive green, which can sometimes lead to vehicles with a patchwork of green and desert tan parts. Australian M1A1s were desert tan when delivered but have undergone a transition to the Australian Army vehicle standard 'Disruptive Pattern Camouflage'; a scheme that consists of black, olive drab, and brown. The U.S. Army can equip its Abrams tanks with the Saab Barracuda camouflage system, which provides concealment against visual, infrared, thermal infrared, and broad-band radar detection. The turret is fitted with two six-barreled smoke grenade launchers (USMC M1A1s use an eight-barreled version). These can create a thick smoke that blocks both vision and thermal imaging. The engine is also equipped with a smoke generator that is triggered by the driver. When activated, fuel is sprayed into the hot turbine exhaust, creating the thick smoke. However, due to the change from diesel as a primary fuel to the use of JP-8, this system is disabled on most Abrams tanks today because of a slightly elevated risk of fire damage to the engine compartment. 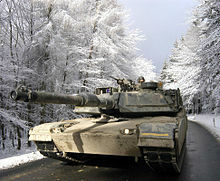 Tankers drive an M1A1 Abrams through the Taunus Mountains north of Frankfurt during Exercise Ready Crucible in February 2005. In July 1973, representatives from Chrysler and General Motors traveled to the United Kingdom, and were escorted by personnel from the Ballistic Research Laboratory and XM1 Project Manager Major General Robert J. Baer to witness the progress of British developed Chobham armor. They observed the manufacturing processes required for the production of Chobham armor which was an arrangement of metal plates, ceramic blocks and open space; and saw a proposed design for a new British vehicle utilizing it. HEAT and Sabot round will make it through the beginning layers of armor but won't make it to the crew compartment. Ceramics have an ability to absorb a lot of heat, and take physical blows. The remaining hot gasses and metal shrapnel spread out or settle in empty air pockets. Both contractors reevaluated their proposed armor configurations based upon the newly obtained data. This led to major changes in the General Motors XM1. The most prominent of which is the turret front changing from vertical to sloped armor. The Chrysler XM1 on the other hand retained its basic shape although a number of changes were made. The Ballistic Research Laboratory had to develop new armor combinations in order to accommodate the changes made by the contractors. Similar to most other main battle tanks, the M1 Abrams feature composite armor only on the frontal aspect of the hull. However, the Abrams' turret features composite armoring across both the front and the sides. In addition the frontal half of the hull side skirts are also comprised of composite, providing superior ballistic protection against chemical energy munitions such as HEAT rounds. The composition of the Abrams' composite armor consists of sandwiched plates of non-explosive reactive armor (NERA) between conventional steel plates. The NERA plates feature elasticity, allowing them to flex and distort upon perforation, disrupting the penetrating jets of shaped charges and providing more material and space for a kinetic round to pass through, thus providing increased protection compared to conventional steel armor. For the base model M1 Abrams, Steven J. Zaloga gives a frontal armor estimate of 350 mm vs armor-piercing fin-stabilized discarding-sabot (APFSDS) and 700 mm vs high-explosive anti-tank warhead (HEAT) in M1 Abrams Main Battle Tank 1982–1992 (1993). In M1 Abrams vs T-72 Ural (2009), he uses Soviet estimates of 470 mm vs APFSDS and 650 mm vs HEAT for the base model Abrams. He also gives the Soviet estimates for the M1A1, 600 mm vs APFSDS, and 700 mm vs HEAT. Armor protection was improved by implementing a new special armor incorporating depleted uranium and other undisclosed materials and layouts. This was introduced into the M1A1 production starting October 1988. This new armor increased effective armor particularly against kinetic energy rounds but at the expense of adding considerable weight to the tank, as depleted uranium is 1.7 times more dense than lead. The first M1A1 tanks to receive this upgrade were tanks stationed in Germany. US-based tank battalions participating in Operation Desert Storm received an emergency program to upgrade their tanks with depleted uranium armor immediately before the onset of the campaign. M1A2 tanks uniformly incorporate depleted uranium armor, and all M1A1 tanks in active service have been upgraded to this standard as well. This variant was designated as the M1A1HA (HA for Heavy Armor). 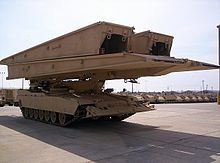 The Abrams may also be fitted with reactive armor over the track skirts if needed (such as the Tank Urban Survival Kit) and slat armor over the rear of the tank and rear fuel cells to protect against ATGMs. Protection against spalling is provided by a kevlar liner. The tank has a halon firefighting system to automatically extinguish fires in the crew compartment. The engine compartment has a firefighting system that is engaged by pulling a T-handle located on the left side of the hull. The Halon gas can be dangerous to the crew. However, the toxicity of Halon 1301 gas at 7% concentration is much less than the combustion products produced by fire in the crew compartment, and CO2 dump would be lethal to the crew. The crew compartment also contains small hand-held fire extinguishers. Fuel and ammunition are stored in armored compartments with blowout panels to protect the crew from the risk of the tank's own ammunition cooking off (exploding) if the tank is damaged—the main gun's ammunition is stored in the rear section of the turret, with blast doors that open under power by sliding sideways only to remove a round for firing, then automatically close. Doctrine mandates that the ammunition door must be closed before arming the main gun. The Tank Urban Survival Kit (TUSK) is a series of improvements to the M1 Abrams intended to improve fighting ability in urban environments. Historically, urban and other close battlefields have been poor places for tanks to fight. A tank's front armor is much stronger than that on the sides, top, or rear. In an urban environment, attacks can come from any direction, and attackers can get close enough to reliably hit weak points in the tank's armor or gain sufficient elevation to hit the top armor. Armor upgrades include reactive armor on the sides of the tank and slat armor (similar to that on the Stryker) on the rear to protect against rocket-propelled grenades and other shaped charge warheads. A Transparent Armor Gun Shield and a thermal sight system are added to the loader's top-mounted M240B 7.62 mm machine gun, and a Kongsberg Gruppen Remote Weapon Turret carrying a .50 caliber machine gun (again similar to that used on the Stryker) is in place of the tank commander's original .50 caliber machine gun mount, wherein the commander had to expose himself to fire the weapon manually. An exterior telephone allows supporting infantry to communicate with the tank commander. The TUSK system is a field-installable kit that allows tanks to be upgraded without needing to be recalled to a maintenance depot. While the reactive armor may not be needed in most situations, like those present in maneuver warfare, items like the rear slat armor, loader's gun shield, infantry phone (which saw use on Marine Corps M1A1s as early as 2003), and Kongsberg Remote Weapons Station for the .50 in caliber machine gun will be added to the entire M1A2 fleet over time. On 29 August 2006, General Dynamics Land Systems received a U.S. Army order for 505 Tank Urban Survivability Kits (TUSK) for Abrams main battle tanks supporting operations in Iraq, under a US$45 million contract. Deliveries were expected to be completed by April 2009. Under a separate order, the U.S. Army awarded General Dynamics Armament and Technical Products (GDATP) US$30 million to produce reactive armor kits to equip M1A2s. The reactive tiles for the M1 will be locally produced at GDATP's Burlington Technology Center. Tiles will be produced at the company's reactive armor facility in Stone County Operations, McHenry, Mississippi. On 8 December 2006, the U.S. Army added Counter Improvised Explosive Device enhancements to the M1A1 and M1A2 TUSK, awarding GDLS $11.3 million contract, part of the $59 million package mentioned above. In December, GDLS also received an order, amounting to around 40% of a US$48 million order, for loader's thermal weapon sights being part of the TUSK system improvements for the M1A1 and M1A2 Abrams Tanks. The USMC M1A1 Trophy Technology Demonstrator (TD) is part of the U.S. Army Ex APS program. 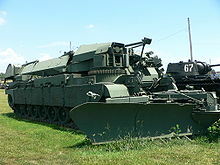 In addition to the armor, some USMC Abrams tanks are equipped with a Softkill Active protection system, the AN/VLQ-6 Missile Countermeasure Device (MCD) that can impede the function of guidance systems of some semi-active control line-of-sight (SACLOS) wire- and radio guided anti-tank missiles (such as the Russian 9K114 Shturm) and infrared homing missiles. The MCD works by emitting a massive, condensed infrared signal to confuse the infrared homing seeker of an anti-tank guided missile (ATGM). However, the drawback to the system is that the ATGM is not destroyed, it is merely directed away from its intended target, leaving the missile to detonate elsewhere. 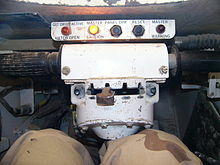 This device is mounted on the turret roof in front of the loader's hatch, and can lead some people to mistake Abrams tanks fitted with these devices for the M1A2 version, since the Commander's Independent Thermal Viewer on the latter is mounted in the same place, though the MCD is box-shaped and fixed in place as opposed to cylindrical and rotating like the CITV. In 2016, the U.S. Army and Marine Corps began testing out the Israeli Trophy active protection system to protect their Abrams tanks from modern RPG and ATGM threats by either jamming (with ATGMs) or firing small rounds to deflect incoming projectiles. The Army plans to field a brigade of over 80 tanks equipped with Trophy to Europe in 2020. It is planned for up to 261 Abrams to be upgraded with the system, enough for four brigades. In June 2018, the Army awarded Leonardo DRS, U.S. partner to Trophy's designer Rafael, a $193 million contract to deliver the system in support of M1 Abrams "immediate operational requirements." The main armament of the original model M1 was the M68A1 105 mm rifled tank gun firing a variety of high explosive anti-tank, high explosive, white phosphorus and an anti-personnel (multiple flechette) round. This gun used a license-made tube of the British Royal Ordnance L7 gun together with the vertical sliding breech block and other parts of the U.S. T254E2 prototype gun. However, it proved to be inadequate; a cannon with lethality beyond the 1.9-mile (3 km) range was needed to combat newer armor technologies. To attain that lethality, the projectile diameter needed to be increased. The tank was able to carry 55 105 mm rounds, with 44 stored in the turret blow-out compartment and the rest in hull stowage. 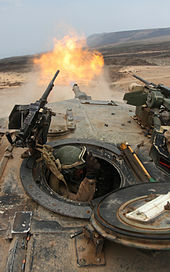 M1 Abrams during a U.S. Army firing exercise, displaying internal crew cabin operations. The main armament of the M1A1 and M1A2 is the M256A1 120 mm smoothbore gun, designed by Rheinmetall AG of Germany, manufactured under license in the U.S. by Watervliet Arsenal, New York. The M256A1 is a variant of the Rheinmetall 120 mm L/44 gun carried on the German Leopard 2 on all variants up to the Leopard 2A5. Leopard 2A6 replaced the L/44 barrel with a longer L/55. Due to the increased calibre, only 40 or 42 rounds are able to be stored depending on if the tank is an A1 or A2 model. The M256A1 fires a variety of rounds. The M829A2 APFSDS round was developed specifically to address the improved protection of a Russian T-72, T-80U or T-90 main battle tank equipped with Kontakt-5 Explosive Reactive Armor. Later, the M829A3 APFSDS round was introduced to improve its effectiveness against next generation ERA equipped tanks. As a counter to that, the Russian army introduced Relikt, the most modern Russian ERA, which is claimed to be twice as effective as Kontakt-5. Development of the M829 series is continuing with the M829A4 currently entering production. The Abrams also fires High-explosive anti-tank warhead shaped charge rounds such as the M830, the latest version of which (M830A1) incorporates a sophisticated multi-mode electronic sensing fuse and more fragmentation which allows it to be used effectively against armored vehicles, personnel, and low-flying aircraft. The Abrams uses a manual loader. The fourth tank crew member on the Abrams also provides additional support for maintenance, observation post/listening post (OP/LP) operations, and other tasks. The new M1028 120 mm anti-personnel canister cartridge was brought into service early for use in the aftermath of the 2003 invasion of Iraq. It contains 1,098 3⁄8-inch (9.5 mm) tungsten balls which spread from the muzzle to produce a shotgun effect lethal out to 600 meters (2,000 ft). The tungsten balls can be used to clear enemy dismounts, break up hasty ambush sites in urban areas, clear defiles, stop infantry attacks and counter-attacks and support friendly infantry assaults by providing covering fire. The canister round is also a highly effective breaching round and can level cinder block walls and knock man-sized holes in reinforced concrete walls for infantry raids at distances up to 75 meters (246 ft). Also in use is the M908 obstacle-reduction round. It is designed to destroy obstacles and barriers. The round is a modified M830A1 with the front fuse replaced by a steel nose to penetrate into the obstacle before detonation. The U.S. Army Research Laboratory (ARL) conducted a thermal analysis of the M256 from 2002 to 2003 to evaluate the potential of using a hybrid barrel system that would allow for multiple weapon systems such as the XM1111 Mid- Range munition, airburst rounds, or XM 1147. The test concluded that mesh density (number of elements per unit area) impacts accuracy of the M256 and specific densities would be needed for each weapon system. The Army is developing a new round to replace the M830/M830A1, M1028, and M908. Called the Advanced Multi-Purpose (AMP) round, it will have point detonation, delay, and airburst modes through an ammunition data-link and a multi-mode, programmable fuse in a single munition. Having one round that does the job of four would simplify logistics and be able to be used on a variety of targets. The AMP is to be effective against bunkers, infantry, light armor, and obstacles out to 500 meters, and will be able to breach reinforced concrete walls and defeat ATGM teams from 500 to 2,000 meters. Orbital ATK was awarded a contract to begin the first phase of development for the AMP XM1147 High Explosive Multi-Purpose with Tracer cartridge in October 2015. In addition to these, the XM1111 (Mid-Range-Munition Chemical Energy) was also in development. The XM1111 was a guided munition using a dual-mode seeker that combined imaging-infrared and semi-active laser guidance. The MRM-CE was selected over the competing MRM-KE which used a rocket-assisted kinetic energy penetrator. The CE variant was chosen due to its better effects against secondary targets, providing a more versatile weapon. The Army hoped to achieve IOC with the XM1111 by 2013. However, the Mid-Range Munition was cancelled in 2009 along with Future Combat Systems. M1A1 firing its main gun as seen from the loader's hatch. The M240 is visible left while the M48 is visible right. A .50 cal. (12.7 mm) M2HB machine gun in front of the commander's hatch. On the M1 and M1A1, this gun is mounted on the Commander's Weapons Station. This allows the weapon to be aimed and fired from within the tank. The later M1A2 variant had a 'flex' mount that required the tank commander to expose his or her upper torso in order to fire the weapon. In urban environments in Iraq this was found to be unsafe. With the Common Remote Operated Weapons System (CROWS) add-on kit, an M2A1 .50 Caliber Machinegun, M240, or M249 SAW can be mounted on a CROWS remote weapons platform (similar to the Protector M151 remote weapon station used on the Stryker family of vehicles). Current variants of the Tank Urban Survival Kit (TUSK) on the M1A2 have forgone this, instead adding transparent gun shields to the commander's weapon station. The upgrade variant called the M1A1 Abrams Integrated Management (AIM) equips the .50 caliber gun with a thermal sight for accurate night and other low-visibility shooting. A 7.62 mm M240 machine gun in front of the loader's hatch on a skate mount (seen at right). Some of these were fitted with gun shields during the Iraq War, as well as night-vision scopes for low-visibility engagements and firing. A second 7.62 mm M240 machine gun in a coaxial mount (i.e., it points at the same targets as the main gun) to the right of the main gun. The coaxial MG is aimed and fired with the same computerized firing control system used for the main gun. (Optional) A second coaxial .50 cal. (12.7 mm) M2HB machine gun can be mounted directly above the main gun in a remote weapons platform as part of the TUSK upgrade kit. The Abrams is equipped with a ballistic fire-control computer that uses user and system-supplied data from a variety of sources to compute, display, and incorporate the three components of a ballistic solution—lead angle, ammunition type, and range to the target—to accurately fire the main gun. These three components are determined using a laser rangefinder, crosswind sensor, a pendulum static cant sensor, data concerning performance and flight characteristics of each specific type of round, tank-specific boresight alignment data, ammunition temperature, air temperature, barometric pressure, a muzzle reference system (MRS) that determines and compensates for barrel drop at the muzzle due to gravitational pull and barrel heating due to firing or sunlight, and target speed determined by tracking rate tachometers in the Gunner's or Commander's Controls Handles. All of these factors are computed into a ballistic solution and updated 30 times per second. The updated solution is displayed in the Gunner's or Tank Commander's field of view in the form of a reticle in both day and Thermal modes. The ballistic computer manipulates the turret and a complex arrangement of mirrors so that all one has to do is keep the reticle on the target and fire to achieve a hit. Proper lead and gun tube elevation are applied to the turret by the computer, greatly simplifying the job of the gunner. 2nd Armored Cavalry Regiment soldier, assisting in the critical job of "boresighting" the alignment of all the tank's sights to the center of the axis of the bore of the main gun on an M1A1 Abrams in Mosul, Iraq in January 2005. Hand signals enable the gunner (inside the tank) to train the main gun onto a boresighting target. The fire-control system uses this data to compute a firing solution for the gunner. The ballistic solution generated ensures a hit percentage greater than 95 percent at nominal ranges. Either the commander or gunner can fire the main gun. Additionally, the Commander's Independent Thermal Viewer (CITV) on the M1A2 can be used to locate targets and pass them on for the gunner to engage while the commander scans for new targets. In the event of a malfunction or damage to the primary sight system, the main and coaxial weapons can be manually aimed using a telescopic scope boresighted to the main gun known as the Gunner's Auxiliary Sight (GAS). The GAS has two interchangeable reticles; one for High-explosive anti-tank warhead and MPAT (MultiPurpose AntiTank) rounds and one for APFSDS and STAFF (Smart Target-Activated Fire and Forget) ammunition. Turret traverse and main gun elevation can be accomplished with manual handles and cranks in the event of a Fire Control System or Hydraulic System failure. The commander's M2HB .50 caliber machine gun on the M1 and M1A1 is aimed by a 3× magnification sight incorporated into the Commander's Weapon Station (CWS), while the M1A2 uses either the machine gun's own iron sights, or a remote aiming system such as the CROWS system when used as part of the TUSK (Tank Urban Survival Kit). The loader's M240 machine gun is aimed either with the built-in iron sights or with a thermal scope mounted on the machine gun. In late 2017, the 400 USMC M1A1 Abrams will be upgraded with better and longer-range sights on the Abrams integrated display and targeting system (AIDATS) replacing the black-and-white camera view with a color one and adding day/night thermal sights, simplified handling with a single set of controls, and a slew to cue button that repositions the turret with a single command. Preliminary testing showed the upgrades reduced target engagement time from six seconds to three by allowing the commander and gunner to work more closely and collaborate better on target acquisition. The M1 Abrams's powertrain consists of a Honeywell AGT 1500 (originally made by Lycoming) multifuel gas turbine capable of 1,500 shaft horsepower (1,100 kW) at 3,000 rpm and 3,950 lb⋅ft (5,360 N⋅m) at 1,000 rpm, and a six-speed (four forward, two reverse) Allison X-1100-3B Hydro-Kinetic automatic transmission, giving it a governed top speed of 45 mph (72 km/h) on paved roads, and 30 mph (48 km/h) cross-country. With the engine governor removed, speeds of around 60 mph (97 km/h) are possible on an improved surface; however, damage to the drivetrain (especially to the tracks) and an increased risk of injuries to the crew can occur at speeds above 45 mph (72 km/h). The tank was built around this engine and it is multifuel–capable, including diesel, kerosene, any grade of motor gasoline, and jet fuel (such as JP-4 or JP-8). For logistical reasons, JP-8 is the U.S. military's universal fuel powering both aircraft and vehicle fleets. On the other hand, Australian M1A1 AIM SA burn diesel fuel, since the use of JP-8 is less common in the Australian Army. The gas turbine propulsion system has proven quite reliable in practice and combat, but its high fuel consumption is a serious logistic issue (starting up the turbine alone consumes nearly 10 US gallons (38 L) of fuel). The engine burns more than 1.67 US gallons (6.3 L) per mile (60 US gallons (230 L) per hour) when traveling cross-country and 10 US gallons (38 L) per hour when idle. The high speed, high temperature jet blast emitted from the rear of M1 Abrams tanks makes it hazardous for infantry to take cover or follow behind the tank in urban combat. The turbine is very quiet when compared to diesel engines of similar power output and produces a significantly different sound from a contemporary diesel tank engine, reducing the audible distance of the sound, thus earning the Abrams the nickname "whispering death" during its first Reforger exercise. Honeywell was developing another gas turbine engine with General Electric for the XM2001 Crusader program that was to be a replacement for the Abrams's AGT-1500 engine. The new LV100-5 engine was lighter and smaller (43% fewer parts) with rapid acceleration, quieter running, and no visible exhaust. It also featured a 33% reduction in fuel consumption (50% less when idle) and near drop-in replacement. The Abrams-Crusader Common Engine Program was shelved when the Crusader program was canceled, however Phase 2 of Army's PROSE (Partnership for Reduced O&S Costs, Engine) program called for further development of the LV100-5 and replacement of the current AGT-1500 engine. General Dynamics has been working on a drop-in diesel engine to replace the gas turbine engine. It is smaller than the turbine, 14% cheaper to operate per mile, and has a four-fan cooling system which is to greatly reduce the tank's heat signature. General Dynamics is offering the Tognum America/12V883 diesel engine with new Diehl 570P3 tracks. The engine represents advancements in diesel engine design since the Abrams was first designed, including a common rail fuel injector system where fuel is pressurized and atomized in the cylinder rather than mechanically sprayed. It also has greater torque, an altered nuclear, biological, and chemical protection system that operates independently of the engine, uses less fuel while idle, is quieter, and gives off significantly less heat and pollutants. Incorporating the diesel engine into the Abrams would decrease the operating cost of an armored brigade combat team by 14 percent per mile, increase its operating range from 205 miles to 300+ miles, and use half the amount of fuel on a combat day than the turbine engine. The tracks are a version of the Leopard 2's tracks with different rubber pads and a larger center guide. The improved engine and tracks are not part of an Army upgrade program, but may be included in a near-term engineering change proposal (ECP) phase. Using a high power density 330 cc (20 in3) Wankel rotary engine modified to use diesel and military grade jet fuel, the Army's TARDEC developed a 220-pound (100 kg) Auxiliary Power Unit designed to fit into the M1 Abrams, replacing an existing battery pack that weighs about 500 pounds (230 kg). The new APU will also be more fuel efficient than the tank's main engine. Testing of the first APUs began in 2009. Marine M1A1 fitted with snorkel attachment and bustle rack extension. A U.S. Army M1A1 after being offloaded from a U.S. Air Force C-17 at Balad Air Base, Iraq in 2004. Strategic mobility is the ability of the tanks of an armed force to arrive in a timely, cost effective, and synchronized fashion. The Abrams can be carried by a C-5 Galaxy or a C-17 Globemaster III. The limited capacity (two combat-ready in a C-5, one combat-ready tank in a C-17) caused serious logistical problems when deploying the tanks for the first Persian Gulf War, though there was enough time for 1,848 tanks to be transported by ship. Marines transport their Marine Air Ground Task Force (MAGTF)-attached Abrams tanks by combat ship. A Wasp-class Landing Helicopter Dock (LHD) typically carries a platoon of 4 to 5 tanks attached to the deployed Marine Expeditionary Unit, which are then amphibiously transported to shore by Landing Craft Air Cushion (LCAC) at 1 combat-ready tank per landing craft. The Abrams is also transportable by truck, namely the M1070 Heavy Equipment Transporter (HET). The HET can operate on highways, secondary roads, and cross-country. The HET accommodates the four tank crew members. The first instance of the Abrams being airlifted directly into a battlefield occurred in October 1993. Following the Battle of Mogadishu, 18 M1 tanks were airlifted by C-5 aircraft to Somalia from Hunter Army Airfield, Georgia. XM1-FSED: Preproduction test model. Eleven Full-Scale Engineering Development test bed vehicles were produced in 1977–78. These vehicles were also called Pilot Vehicles and numbered PV-1 through PV-11. M1: First production variant. Production began (at Chrysler) in 1979 and continued to 1985 (at General Dynamics) (3,273 built for the US). The first 110 tanks were Low Rate Initial Production (LRIP) models, still called XM1s, because they were built prior to the tank being type-classified as the M1. M1IP (Improved Performance): Produced briefly in 1984 before the M1A1, contained upgrades and reconfigurations like new turret with thicker frontal armor, new turret is referred as "long" turret instead of older "short" turret, armor upgraded from ~650mm line of sight thickness to ~880mm (894 built for US). M1A1:[nb 2] Production started in 1985 and continued to 1992, pressurized NBC system, rear bustle rack for improved stowage of supplies and crew belongings, redesigned blow-off panels and M256 120 mm smoothbore cannon (4,976 built for the U.S. Army, 221 for USMC, 755 for Egypt, 59 M1A1 AIM SA sold to Australia). M1A1D (Digital): A digital upgrade for the M1A1HC, to keep up with M1A2 SEP, manufactured in quantity for only 2 battalions. M1A1AIM v.1 (Abrams Integrated Management): A program whereby older units are reconditioned to zero hour conditions; and the tank is improved by adding Forward-Looking Infra-Red (FLIR) and Far Target Locate sensors, a tank-infantry phone, communications gear, including FBCB2 and Blue Force Tracking to aid in crew situational awareness, and a thermal sight for the .50 caliber machine gun. M1A1AIM v.2/M1A1SA (Situational Awareness): Upgrades similar to AIM v.1 tanks + new 3rd generation depleted uranium armor components. M1A1FEP (Firepower Enhancement Package): Similar upgrade to AIM v.2 for USMC tanks. M1A1 (AIDATS upgrade): Upgrade-only variant to all USMC General Dynamics M1A1 Abrams tanks to improve the tank commander's situational awareness with an upgraded thermal sight, color day camera, and a stationary color display. M1A2 (Baseline): Production began in 1986 and entered service in 1992 (77 built for the U.S. and more than 600 M1s upgraded to M1A2, 315 for Saudi Arabia, 218 for Kuwait). The M1A2 offers the tank commander an independent thermal sight and ability to, in rapid sequence, shoot at two targets without the need to acquire each one sequentially, also 2nd generation depleted uranium armor components. M1A2 SEP (System Enhancement Package): Has upgraded third-generation depleted uranium armor components with graphite coating (240 new built, 300 M1A2s upgraded to M1A2 SEP for the USA, also unknown numbers of upgraded basic M1s and M1IPs, also 400 oldest M1A1s upgraded to M1A2 SEP). M1A2S (Saudi Package): Saudi Arabian variant upgrade of the M1A2 based on M1A2 SEP, with some features, such as depleted uranium armor, believed to be missing (442 M1A2s upgraded to M1A2S). M1A2 SEPv2: Added Common Remotely Operated Weapon Station as standard, color displays, improved interfaces, a new operating system, improved front and side armor with ERA (TUSK kit), tank-infantry phone as standard, and an upgraded transmission for better durability. M1A2C (SEPv3): Has increased power generation and distribution, better communications and networking, new Vehicle Health Management System (VHMS) and Line Replaceable Modules (LRMs) for improved maintenance, an Ammunition DataLink (ADL) to use airburst rounds, improved counter-IED armor package, improved FLIR using long- and mid-wave infrared, a low-profile CROWS RWS, and an Auxiliary Power Unit (APU) under armor to run electronics while stationary instead of the engine, visually distinguishing the version by a small exhaust at the left rear. More passive ballistic protection added to the turret faces, along with new Explosive Reactive Armor mountings and Trophy Active Protection systems added to the turret sides. Prototypes began testing in 2015, and the first were delivered in October 2017. Fielding is expected to begin in 2020. M1A2X: Special configuration variant of the M1A2C reportedly being offered for sale to Taiwan as of March 2019. M1A2D (SEPv4): Under engineering development with delivery planned to start by 2020. The Commander’s Primary Sight, also known as the Commander’s Independent Thermal Viewer, and Gunner’s Primary Sight will be upgraded with 3rd Gen FLIR, an improved laser rangefinder and color cameras. Additional improvements will include advanced meteorological sensors, laser warning/detection receivers, directional smoke grenade launchers and integration of the new XM1147 multi-purpose (AMP) 120mm tank round. The AN/VVR-4 laser warning receiver and ROSY rapid obscurant system have been trialed by the US Army for adoption on the Abrams tank and Bradley fighting vehicle. M1A2-K: Under development, unique variant for the Kuwaiti Army, slated to replace Kuwait's current M1A2 fleet. M1 TTB (Tank Test Bed): Prototype with unmanned turret, 3 crew members in armored capsule in front of the heavy armored hull, main armament was 120 mm smoothbore gun, M256 derivative or modification, mechanical loading system under turret, never fielded. 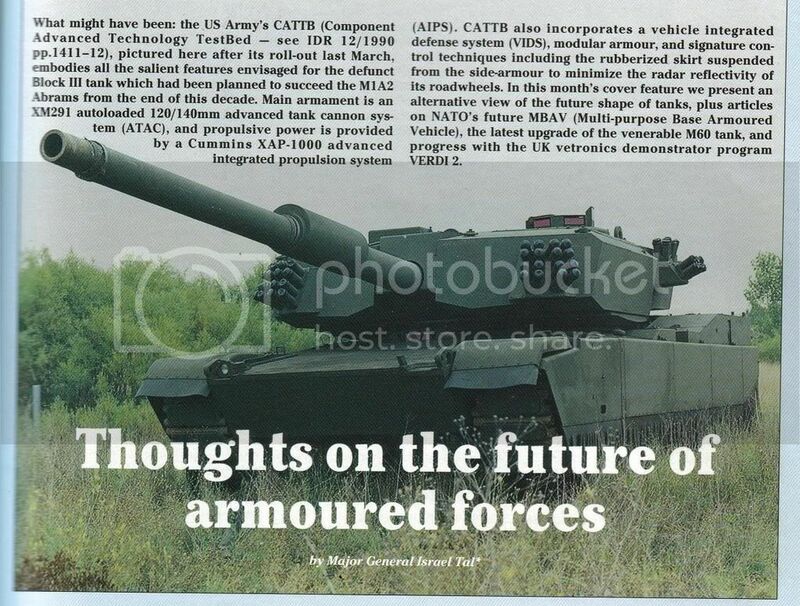 CATTB: The Component Advanced Technology Test Bed was an experimental model with a lightweight 120 mm smoothbore cannon, heavy armored turret and upgraded hull based on the M1 chassis. It had a mechanical loading system in turret bustle, a new engine and probably other upgrades, never fielded. The tank went into trials in 1987–88. M1 Thumper: Experimental variant by Lockheed Martin, equipped with the 140 mm XM291 ATACS smoothbore cannon. Similar to the CATTB, it included a larger, elongated turret to offer protection levels comparable to the M1A2 while allowing the mounting of the larger cannon and its longer ammunition. Cancelled with the end of the Cold War, and never fielded. M1 Grizzly Combat Mobility Vehicle (CMV). M1 Panther II: A remote controlled mine clearing vehicle with turret removed, mine rollers on front, and the Standardized Teleoperation System. M1074 Joint Assault Bridge (JAB): Bridgelayer combining a heavy "scissor" bridge with the M1 Abrams chassis. Expected to reach low-rate initial production in 2019 to replace the M60 AVLB and M104 Wolverine. M1150 Assault Breacher Vehicle (ABV): Assault variant for the USMC. Based upon the M1A1 Abrams chassis, the Assault Breacher Vehicle has a variety of systems installed, such as a full-width mine plow, two linear demolition charges, and a lane-marking system. Reactive armor has been fitted to the vehicle providing additional protection against High-explosive anti-tank warhead-based weapons. The turret has been replaced by a new smaller one with two MICLIC launchers at its rear. A M2HB .50 machine gun in a remote weapons station is mounted on the commander's cupola and a bank of grenade launchers are fitted to each side of the superstructure to cover the frontal arc for self-protection. M1 Armored Recovery Vehicle: Only a prototype produced. Egyptian Abrams tank deployed during the 2011 Egyptian Revolution. Australia – Australian Army: 59 M1A1 (AIM) configuration tanks (hybrids with a mix of equipment used by U.S. Army and U.S. Marine Corps but without depleted uranium layers in armor). These tanks were bought from the U.S. in 2006 and replaced the Leopard AS1 in 2007. As of 2017, the Australian Government was considering expanding the Army's fleet of Abrams to 90 tanks. In 2016, Lieutenant General Angus Campbell stated that the Australian army may upgrade its current M1A1 fleet to the M1A2C under LAND 907 Phase 2. Egypt – Egyptian Army: 1,005 M1A1 tanks co-produced by the U.S. and Egypt for the Egyptian army. Another 200 tanks have been ordered. Iraq – Iraqi Army: 140 M1A1Ms (without depleted uranium layers in armor). 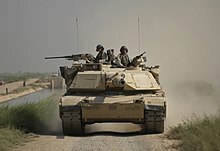 Iraq was leasing 22 U.S. Army M1A1s for training in 2008. 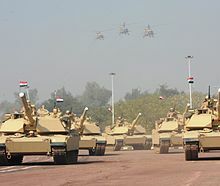 The first 11 tanks were delivered to the Iraqi Army in August 2010. All were delivered by August 2011. In October 2012, it was reported that six more tanks were being delivered. Saudi Arabia – Saudi Arabian Army: 373 Abrams tanks, To be upgraded to M1A2S configuration in Saudi Arabia. 69 more M1A2S tanks ordered on 8 January 2013, to be delivered by 31 July 2014. Morocco – Royal Moroccan Army: 222 M1A1 SA (situational awareness) tanks ordered in 2015. Deliveries under the contract started in July 2016 with an estimated completion date of February 2018. The contract include 150 refurbished and upgraded tanks to the special armor configuration, tanks are completely disassembled and overhauled to a zero-mile condition, and are configured with armor upgrades and additional mission-critical technologies to help augment crew situational awareness, it features gunners primary sight, new Block I 2nd generation forward-looking infrared technology, and a blue force tracking system for enhanced effectiveness in the battlefield. Associated weapons, ammunition, and equipment are also included. Morocco took delivery of the first batch of M1A1SAs on 28 July 2016. United States – United States Army and United States Marine Corps have received over 8,100 M1, M1A1 and M1A2 tanks combined. Peru – Peruvian Army: In May 2013, the M1A1 Abrams was reported to be part of comparative tests to be conducted by Peru to find a replacement for their aging T-55s. Between 120 and 170 tanks may be acquired. The Abrams competed against the T-90S, Leopard 2A4 and A6, T-64, and T-84. By September 2013, only the M1A1 Abrams, Russian T-90S and T-80, and Ukrainian T-84 were still competing. Taiwan – Republic of China Army: Taiwan had considered the purchasing up to 200 M1A2 tanks but settled on 120 used M1A1 tanks for funding reasons. The Ministry of National Defence stated in 2016 that it was in discussion with the U.S. about sales of M1A1s. This plan however was apparently canceled by October 2017, instead Taiwanese government plans to upgrade its M60A3 in service with a 120 mm main gun, new ballistics computer, etc. In July 2018, Taiwan's Ministry of National Defense budgeted money to purchased 108 M1A2 tanks from the U.S. government, to replace its aging CM-11 Brave Tiger and M60A3 TTS battle tanks. It is uncertain whether it will receive U.S. approval. ^ In M1 Abrams Main Battle Tank 1982–1992 (1993), Steven J. Zaloga writes, "[t]he new armour reportedly gives the M1A1HA the equivalent of 1,300 mm steel armour against shaped charge warheads and 600 mm against APFSDS,..." (page 11), which is at least partial a contradiction to what he wrote in M1 Abrams vs T-72 Ural (2009). On page 27 is a chart where the frontal turret armor of the M1A1HA is claimed to be equivalent to 800 mm steel armor (RHA). They're both estimates Zaloga just chose to use Soviet estimates for the table in M1 Abrams vs T-72 Ural. ^ During early development in the late 1970s it was referred to as the XM-1E. ^ a b John Pike. "Lima Army Tank Plant (LATP)". Globalsecurity.org. Archived from the original on 25 September 2010. Retrieved 30 June 2010. ^ a b "Department of Defense – Annual Report FY99". Archived from the original on 3 November 2013. Retrieved 20 February 2014. ^ "M1A2 Abrams". Retrieved 12 December 2017. ^ "ASAALT Weapon Systems Handbook 2018" (PDF). Office of the Assistant Secretary of the Army (Acquisition, Logistics and Technology). Retrieved 19 October 2018. ^ a b c "Abrams Tank Fact File for the United States Army". United States Army. Archived from the original on 15 November 2013. Retrieved 16 November 2015. ^ a b c d Zaloga 2009, p. 15: Author mentions that a Soviet report estimated the protection of the basic M1 to be equivalent to 470 mm steel armor against armor-piercing rounds and equivalent to 650 mm steel armor against shaped charge warheads. ^ a b Zaloga & Sarson 1993, pp. 9–10: Zaloga gives another set of figures in this book 350mm against APFSDS and 700mm vs HEAT. ^ a b Foss, Chris. Jane's Armour and Artillery 2005–2006. Jane's Information Group. p. 162. ISBN 0-7106-2686-X. ^ a b c Pike, John E. "M1 Abrams Main Battle Tank". GlobalSecurity.org. Archived from the original on 25 October 2015. Retrieved 16 November 2015. ^ M1 Abrams Main Battle tank Archived 21 August 2010 at the Wayback Machine. FAS.org, 14 April 2000. ^ Hunnicutt 1984, pp. 6, 149, 408. ^ a b c d Osborn, Kris (26 September 2009). "Army looking into lighter Abrams tank". Army Times. Archived from the original on 21 July 2012. Retrieved 31 December 2013. ^ John Pike (13 May 2010). "MBT-70 / XM803". Globalsecurity.org. Archived from the original on 23 August 2010. Retrieved 30 June 2010. ^ Hunnicutt, R.P. (1990). Abrams: A History of the American Main Battle Tank. Presidio. p. 202. ISBN 9780891413882. ^ "General Dynamics buys Chrysler tank division". New York Times, 20 February 1982. Archived from the original on 3 April 2017. Retrieved 3 April 2017. ^ History of the U.S. Army Research Laboratory. 2017. ^ a b c "How M1 Tanks Work". HowStuffWorks. 2002-05-07. Retrieved 2018-04-03. ^ Pike, John. "Lima Army Tank Plant (LATP)". Globalsecurity.org. Archived from the original on 3 March 2014. Retrieved 20 February 2014. ^ GAO/NSIAD-92-94, "Operation Desert Storm: Early performance assessment of Bradleys and Abrams" Archived 14 June 2007 at the Wayback Machine, p. 24. GAO, January 1992. Quote: "... 23 Abrams tanks were destroyed or damaged in the Persian Gulf area. Of the nine Abrams destroyed, seven were due to friendly fire, and two were intentionally destroyed to prevent capture after they became disabled. Other Abrams tanks were damaged by enemy fire, land mines, on-board fires, or to prevent capture after they became disabled." ^ Wyden, Ron (January 1992). "OPERATION DESERT STORM: Early Performance Assessment of Bradley and Abrams" (PDF). Government Accountability Office. ^ "A Company, 3–66 Armor, Abrams (Bumper # A-33)". TAB H – Friendly-fire Incidents. Archived from the original on 8 July 2013. At approximately 4:30 AM on 27 February, an anti-tank guided missile (probably fired from a Bradley) struck A-33 in the engine compartment. The crew, uninjured, was evacuating the disabled tank when two DU rounds hit the tank in the left side of the hull and exited through the right side. The tank commander, driver, and gunner sustained injuries from fragments. The loader, who was already outside the tank, was uninjured. A-31 crew members assisted in rescuing A-33's crew. ; Sketch depicting the path of a DU 120 mm round through the hull of Abrams C-12 Archived 27 June 2009 at the Wayback Machine. OSD. ^ a b "Army Equipment Program" Archived 9 April 2015 at the Wayback Machine. U.S. Army, May 2014. ^ Komarow, Steven. "Tanks take a beating in Iraq" Archived 18 March 2012 at the Wayback Machine. USA Today, 29 March 2005. ^ Greem, Michael. M1 Abrams at War 2005. Zenith Press. p. 99. ISBN 0-7603-2153-1. Archived from the original on 20 September 2017. ^ "Technical Intelligence Bulletins". Wlhoward.com. May–June 2003. Archived from the original on 12 March 2007. ^ Conway, John P. (7 January 2004). "Abrams Tank Systems: Lessons Learned Operation Iraqi Freedom" (PDF). Archived (PDF) from the original on 5 September 2006. ^ "M1A2 Abrams struck by Vehicle-Borne IED". Archived from the original on 7 July 2013. Retrieved 10 September 2010. ^ "U.S. Army Battling To Save Equipment". Washington Post. Archived from the original on 6 October 2014. Retrieved 11 October 2014. ^ "PROTECTOR Remote Weapon Station". Kongsberg Protech Systems. Archived from the original on 5 October 2013. Retrieved 4 October 2013. ^ Komarow, Steven. "Tanks adapted for urban fights they once avoided" Archived 22 August 2011 at the Wayback Machine. USA Today, 29 March 2005. ^ Michael R. Gordon (21 May 2008). "Operation in Sadr City Is an Iraqi Success, So Far". The New York Times. Archived from the original on 23 June 2017. ^ "Super RPG threat, Army passes on system that could defeat RPG-29, DoD officials say". ArmyTimes. Archived from the original on 2012-07-19. ^ Michael Pregent; Michael Weiss (12 August 2014). "Exploiting the ISIS Vulnerabilities in Iraq". Wall Street Journal. Archived from the original on 10 December 2015. Retrieved 8 December 2015. Yet ISIS does not have the highly trained maintenance crews that are necessary to keep these weapons in good working order. ^ U.S. Tanks En Route to Southwestern Afghanistan Archived 30 May 2011 at the Wayback Machine. American Forces Press Service, 19 November 2010. Retrieved 12 March 2011. ^ Vosman, Dylan (14 May 2015). "Saudi M1A2 Abrams MBTs deployed near Yemen border". Defence Blog: Military and Defence News. Archived from the original on 25 September 2015. ^ "Kingdom of Saudi Arabia - M1A2S Saudi Abrams Main Battle Tanks and M88Al/A2 Heavy Equipment Recovery Combat Utility Lift Evacuation System (HERCULES) Armored Recovery Vehicles (ARV)". Defense Security Cooperation Agency. 9 August 2016. Archived from the original on 13 September 2016. Retrieved 19 September 2016. ^ Ewing, Philip (21 April 2011). "The tank at the end of history". DoD Buzz. Military.com. Archived from the original on 25 April 2011. Retrieved 23 April 2011. ^ "Support Abrams". General Dynamic Land Systems. Archived from the original on 10 April 2011. Retrieved 23 April 2011. ^ "Lighter, Yet Deadlier". Gannett Government Media Corporation. Archived from the original on 10 January 2013. Retrieved 24 July 2011. ^ "Over Army Objections, Industry and Congress Partner to Keep Abrams Tank Production 'Hot'"[permanent dead link]. National Defense Magazine, October 2013. ^ Asia-Pacific Defence Reporter, Volume 30. 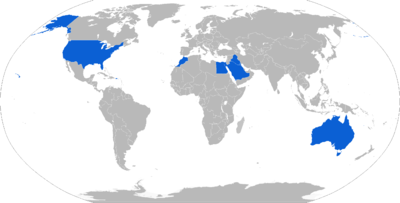 Asia-Pacific Defence Publications. 2004. Retrieved 2 April 2011. ^ Wasserbly, Daniel (14 October 2014). "AUSA 2014: Army outlines upcoming combat vehicle choices". IHS Jane's International Defence Review. Archived from the original on 29 April 2015. ECP1A for Abrams, which just completed a 'critical design review', and includes design efforts to incorporate data links for future ammunition, increased protection, as well as on-board diagnostics and a shift from line replaceable units (LRUs) to line replaceable modules (LRMs). LRMs are easier to replace because there are fewer cables, boxes, and cards to handle. ^ "Army Evaluated Nine Vehicles Against GCV In Analysis Of Alternatives". Inside Washington Publisher. January 2010. Archived from the original on 28 September 2010. Retrieved 12 January 2011. ^ "General Dynamics Land Systems M1/M1A1/M1A2 Abrams MBT (United States), MBTs and medium tanks". Jane's Armour and Artillery. Jane's Information Group. Archived from the original on 11 August 2011. Retrieved 1 July 2011. ^ "New Army tank could mean changes for M1A1 fleet". Marine Corps Times. 30 September 2009. Archived from the original on 10 September 2012. Retrieved 31 December 2013. ^ Osborn, Kris (2017-03-01). "Army Plans New Tank After Abrams - 2030s". Archived from the original on 2017-03-23. ^ Osborn, Kris (2017-01-13). "The U.S. Army Has Big Plans for a New Super Tank (Lasers Included)". The National Interest. ^ Australian Government, Department of Defence (13 May 2010). "Exercise Chong Ju – Desert tan vs Auscam Abrams". Defence.gov.au. Archived from the original on 29 July 2012. Retrieved 28 June 2011. ^ Hunnicutt, R.P. (1990). Abrams: A History of the American MBT. Presidio. p. 177. ^ Hunnicutt, R.P. (1990). Abrams: A History of the American MBT. Presidio. p. 178. ^ M.m (2017-01-18). "Below The Turret Ring: Early M1 Abrams composite armor". Below The Turret Ring. Retrieved 2019-02-21. ^ Hunnicutt, R.P. (1990). Abrams: A History of the American MBT. Presidio. p. 245. ^ "BBC: US to use depleted uranium". BBC News. 18 March 2003. Archived from the original on 19 May 2009. Retrieved 9 June 2009. ^ Clancy, Tom: Armored Cav: A Guided Tour of an Armored Cavalry Regiment. Berkeley Books, 1994, p. 58. ^ Prado, Fabio. "Main Battle Tank - M1, M1A1, and M1A2 Abrams". www.fprado.com. Archived from the original on 22 November 2016. Retrieved 5 March 2017. ^ "NIOSH Pocket Guide to Chemical Hazards". CDC. Archived from the original on 18 August 2017. ^ a b "Tank Urban Survivability Kit (TUSK)". Archived from the original on 13 October 2014. Retrieved 11 October 2014. ^ "Defense Update.com". Defense Update.com. 25 April 2006. Archived from the original on 10 March 2009. Retrieved 9 June 2009. ^ All Armored Brigades To Get Active Protection Systems: Gen. Milley. Breaking Defense. 15 May 2018. ^ Abrams tanks get new round of Israeli-made ‘shields’ to fend off anti-tank weapons. Army Times. 6 July 2018. ^ Fabio Prado. "Main Battle Tank – M1, M1A1, and M1A2 Abrams". Fprado.com. Archived from the original on 11 July 2011. Retrieved 28 June 2011. ^ "Internet Archive Wayback Machine". Web.archive.org. 24 February 2008. Archived from the original on 24 February 2008. Retrieved 28 June 2011. ^ "Next-Gen 120 mm Tank Killer: ATK's M829E4 AKE". Defense Industry Daily. Archived from the original on 16 July 2011. ^ Hilmes (2004), p. 79. ^ South, Joseph; Carter, Robert (August 2005). "Thermal Analysis of an M256 120-mm Cannon". Army Research Laboratory. ^ "Clank Softly and Carry a Better Shillelagh". Defense Industry Daily. Archived from the original on 7 June 2011. ^ "MRM cancelled" Archived 9 November 2011 at the Wayback Machine. Soldiergeek.com, 11 July 2011. ^ a b "General Dynamics Awarded $34 Million for M1A1 Abrams Tank Upgrades" (Press release). General Dynamics. 5 September 2008. Archived from the original on 3 January 2010. ^ "Heavy duty: overhaul under way for Abrams tank engine". Accessmylibrary.com. 1 September 2006. Archived from the original on 11 January 2009. Retrieved 9 June 2009. ^ Fabio Prado. "Main Battle Tank – M1, M1A1, and M1A2 Abrams". 64.26.50.215. Archived from the original on 29 September 2007. Retrieved 9 June 2009. ^ "GE Press Release: GE and Honeywell Begin Testing of LV100-5 Engine For Abrams-Crusader Common Engine Program". Geae.com. 27 August 2001. Archived from the original on 28 September 2010. Retrieved 9 June 2009. ^ "AIM Program's M1A1 Tank Refits and Rebuilds Continue". Defenseindustrydaily.com. 2 May 2005. Archived from the original on 14 July 2009. Retrieved 9 June 2009. ^ "Diesel M1 engine" Archived 4 September 2015 at the Wayback Machine. Nationaldefensemagazine.com, January 2013. Retrieved: 17 December 2012. ^ "TARDEC Auxiliary Power Unit for a tank". Engineeringtv.com. Archived from the original on 21 June 2009. Retrieved 9 June 2009. ^ Department of the Army (2009). "7". U.S. Army Warrior Ethos And Combat Skills Handbook (Field Manual No. 3‑21.75). Morris Book Publishing, LLC. ISBN 978-1-59921-819-9. Archived from the original on 20 July 2011. Retrieved 2 June 2010. ^ "M1070 Heavy Equipment Transporter (HET) Fact File United States Army". Army.mil. Archived from the original on 6 July 2010. Retrieved 30 June 2010. ^ Haulman, Daniel L. "THE UNITED STATES AIR FORCE IN SOMALIA, 1992-1995" (PDF). ^ Leland, John W. "THE CHRONOLOGICAL HISTORY OF THE C-5 GALAXY" (PDF). ?. ^ "M1 Abrams Main Battle Tank". Fas.org. Archived from the original on 21 August 2010. Retrieved 30 June 2010. ^ a b "Armor: Iraq Getting M-1A1 Tanks". Strategypage.com. 3 August 2008. Archived from the original on 16 April 2009. Retrieved 9 June 2009. ^ Tyler Rogoway. "Houthi Rebels Destroy M1 Abrams Tanks With Basic Iranian Guided Missiles". Foxtrot Alpha. Archived from the original on 9 September 2017. Retrieved 14 April 2016. ^ "Saudi Arabia Orders 69 More M1A2S Abrams Heavy Tanks". Archived from the original on 3 March 2016. Retrieved 14 April 2016. ^ a b Administrator. "M1A2 Abrams SEP V3 main battle tank technical data sheet specifications pictures video 11710154 - United States army heavy armoured vehicles tank UK - United States US Army Military equipment UK". Archived from the original on 1 April 2016. Retrieved 14 April 2016. ^ "New designations for upgraded M1A2 SEPv3 and SEPv4 Abrams main battle tanks". Army Recognition. Retrieved 19 October 2018. ^ "Taiwan seeks to procure M1A2X main battle tank from US". Defence Blog. 19 March 2019. Archived from the original on 19 March 2019. Retrieved 19 March 2019. ^ Drillsma, Ryan (19 March 2019). "US could announce sale of M1A2X tanks to Taiwan before July". Taiwan News. Taipei. Archived from the original on 19 March 2019. Retrieved 19 March 2019. ^ Dean, Glenn. "2017 NDIA Armaments Systems Forum" (PDF). National Defense Industrial Association. Retrieved 23 July 2018. ^ "US engineering big upgrades for M1A2 SEP v4 Abrams tanks starting in 2021 to match Russian Armata and other new tanks - NextBigFuture.com". 17 November 2016. ^ Villasanta, Arthur Dominic (28 March 2017). "New US Army M1 Abrams Tank Rounds can Easily Destroy the T-14 Armata". ^ Administrator. "U.S. Army will begin the development of M1A2 Abrams SEP V4 main battle tank 11302171 - February 2017 Global Defense Security army news industry - Defense Security global news industry army 2017 - Archive News year". www.armyrecognition.com. ^ tmgdadmin (5 September 2017). "General Dynamics Receives Contracts to Upgrade Abrams Main Battle Tanks". ^ "UTC Aerospace readies AN/VVR-4 laser warning system". Jane's 360. Archived from the original on 23 July 2018. Retrieved 23 July 2018. ^ "Laser warning goes modular". Jane's 360. Retrieved 23 July 2018. ^ "Rheinmetall ROSY at US Army Expeditionary Warrior Experiments 2018". Youtube. Rheinmetall Defence. Retrieved 23 July 2018. ^ Binnie, Jeremy (20 December 2017). "Kuwait to get 'unique' Abrams tank variant". IHS Jane's 360. Archived from the original on 26 December 2017. Retrieved 26 December 2017. ^ Khourdaji, Samir (May 1990). "RD & E Centre Technical Report No. 13492 "FINITE STRESS ANALYSIS FOR COMPONENT ADVANCED TECHNOLOGY TEST BED (CATTB)". Defense Technical Information Center. Defense Technical Information Center. Retrieved 16 July 2016. ^ "CATTB data". Archived from the original on 30 September 2011. Retrieved 28 June 2011. ^ John Pike. "Grizzly [Breacher]". Globalsecurity.org. Archived from the original on 6 July 2010. Retrieved 30 June 2010. ^ John Pike. "Panther". Globalsecurity.org. Archived from the original on 9 June 2010. Retrieved 30 June 2010. ^ John Pike. "Wolverine (Heavy Assault Bridge)". Globalsecurity.org. Archived from the original on 16 July 2010. Retrieved 30 June 2010. ^ "ABV Assault Breacher Vehicle engineer armoured vehicle tank". Archived from the original on 6 February 2010. Retrieved 5 February 2010. ^ Abramson, Mark, "ABVs ready to break Afghan ground", Stars and Stripes, 1 February 2010. ^ "Acquisition of the ABRAMS Main Battle Tank". Australian National Audit Office. 17 July 2007. Archived from the original on 5 June 2011. Retrieved 6 May 2014. ^ Abernethy, Mark (7 March 2017). "Army's plans for more and better tanks". Australian Financial Review. Retrieved 20 August 2018. ^ Campbell, Angus. "Chief of Army address to the Defence Magazine Conference". Australian Army. Retrieved 17 March 2019. ^ "Procurement: Iraq Buys What It Knows". Strategypage.com. 18 December 2008. Archived from the original on 15 April 2009. Retrieved 9 June 2009. ^ "Iraqi military plans major arms purchase" Archived 18 July 2011 at the Wayback Machine. Your Defence News, 16 December 2008. ^ M1 Abrams Tanks for Iraq Archived 19 September 2008 at the Wayback Machine. Defense Industry Daily, 15 March 2009. ^ Agence France-Presse (9 August 2010). "Iraq takes delivery of American tanks". defencetalk.com. Archived from the original on 14 August 2010. ^ "6 more tanks" Archived 19 September 2008 at the Wayback Machine. Defenseindustrydaily.com, 5 October 2012. ^ a b "The 2006 Saudi Shopping Spree: $2.9B to Upgrade M1 Abrams Tank Fleet". DefenseIndustryDaily.com. 4 January 2011. Archived from the original on 25 October 2006. Retrieved 28 July 2011. ^ "Saudi Arabia Orders 69 More M1A2S Abrams Heavy Tanks" Archived 3 March 2016 at the Wayback Machine. Deagel.com, 8 January 2013. ^ "Morocco Purchases US-Made M1A1 Abrams Tanks". Morocco World News. 30 August 2015. Archived from the original on 3 May 2016. Retrieved 14 April 2016. ^ "General Dynamics Awarded $358 Million for 150 M1A1 SA Abrams Tanks for Morocco". generaldynamics.com. 30 September 2015. Archived from the original on 15 April 2016. Retrieved 14 April 2016. ^ "بالصور حفل تسلم أولى دبابات "أبرامز" الأمريكية الموجهة للقوات المسلحة الملكية". Medi 1. Archived from the original on 1 August 2016. Retrieved 26 July 2016. ^ "Morocco Abrams tank programme moves forward". IHS Janes. Archived from the original on 4 March 2016. Retrieved 14 April 2016. ^ Binnie, Jeremy (28 July 2016). "North African rivals receive new tanks". IHS Jane's. Retrieved 29 July 2016. ^ Fabio Prado (10 December 2009). "Main Battle Tank – M1, M1A1, and M1A2 Abrams". Armorsite. Archived from the original on 3 July 2009. Retrieved 9 June 2009. ^ a b Pike, John (16 January 2013). "M1 Abrams Main Battle Tank". Global Security. ^ Osborn, Kris (16 October 2017). "First New Army M1A2 SEP v3 Abrams Tank Arrives". Scout. Archived from the original on 10 October 2017. ^ Ζητήστε μας ό,τι σας χρειάζεται (in Greek). Kathimerini. n.d. Archived from the original on 7 July 2012. Retrieved 9 April 2012. ^ "Πέντε C 130 και 100 άρματα μάχης Abrams "έρχονται" από ΗΠΑ". onalert.gr. Archived from the original on 12 November 2014. Retrieved 1 April 2015. ^ Peru; Future main battle tank projects lags on despite criticism Archived 28 September 2013 at the Wayback Machine. Dmilt.com, 2 September 2013. ^ Abrams tanks still on defense wish list. Taipei Times. 24 May 2015. Archived from the original on 31 December 2016. Retrieved 31 December 2016. ^ MND confirms U.S. M1A1 tank sales to Taiwan under negotiation. Taipei Times. 14 November 2016. Archived from the original on 31 December 2016. Retrieved 31 December 2016. ^ Yeo, Mike (6 October 2017). "Giving up on Abrams tank acquisition, Taiwan moves to upgrade its M60A3 tanks". ^ "Taiwan Army mulls spending US$990 million on M1A2 tanks". FOCUS TAIWAN News Channel. 9 July 2018. Orr, Kelly. King of the Killing Zone. W.W. Norton Company, 1989. Rostker, Bernard (1998). "Environmental Exposure Report: Depleted Uranium in the Persian Gulf (II)". DoD Publication, gulflink.osd.mil. Archived from the original on 3 June 2010. Retrieved 30 June 2010. Hilmes, Rolf (1 December 2004). "Arming Future MBTs – Some Considerations". Military Technology. Mönsch. Hunnicutt, R.P. "Patton: A History of the American Main Battle Tank". Presidio Press, 1984 ISBN 0-89141-230-1. Forty, George: Tank Action. From the Great War to the Persian Gulf, Allan Sutton Publishing Ltd., Phoenix Mill 1995. "M1 Abrams Main Battle Tank". FAS Military Analysis Network. Retrieved 17 January 2004. "TUSK to update Abrams for urban battle". Army News Service. Archived from the original on 16 March 2005. Retrieved 6 April 2005. Zaloga, Steve; Sarson, Peter (1993). M1 Abrams Main Battle Tank 1982–1992. New Vanguard (Book 2). Oxford, UK: Osprey Publishing. ISBN 1-85532-283-8. Zaloga, Steven J. (2009). M1 Abrams vs T-72 Ural: Operation Desert Storm 1991. Oxford, UK; New York: Osprey Publishing. ISBN 978-1-84603-407-7. LCCN 2009502059.